Examines the content and message of Job, Psalms, Proverbs, Ecclesiastes, and Song of Songs to help readers better understand the overall flow of each book. 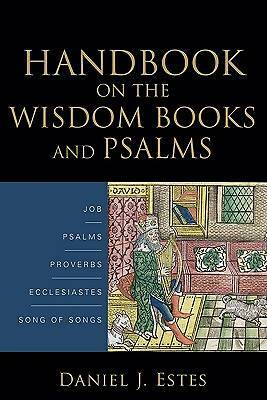 This valuable resource introduces readers to the Old Testament books of wisdom and poetry--Job, Psalms, Proverbs, Ecclesiastes, and Song of Songs--and helps them better understand each book's overall flow. Estes summarizes some of each book's key issues, offers an exposition of the book that interacts with major commentaries and recent studies, and concludes with an extensive bibliography. Now in paperback. LONGER BLURB: In this work, Daniel Estes introduces students to the Old Testament poetical books--Job, Psalms, Proverbs, Ecclesiastes, and Song of Songs. Each chapter explores one of the five poetical books. Estes first summarizes some of the book's key issues. He then devotes the main portion of the chapter to an exposition of the book, interacting with major commentaries and recent studies. Each chapter concludes with an extensive bibliography, allowing for further exploration. Following in the tradition of Handbook on the Pentateuch (over sixty thousand copies sold), this valuable resource will help pastors, students, Sunday school teachers, and Bible study leaders better understand the overall flow of each poetical book.